I still remember him wearing his gi into the cage. That was back when it was still all different types of styles instead of some sort of makes of jiu jitsu. Feels like Tuesday to me, I didn't work Thursday afternoon through Monday. I bet a few did....what...wait? I blew off Monday visiting my grandson. So I don't know what the heck day it is other than it's a workday. Introduced my future father in law to Rockauto. Now he calls me every other night to order parts for him lol. But seriously, the mark up on parts locally is insane. Gasket, Gunther, and Goliath need a home in Edmonton Canada. They must stay together they are buddies. yeah, 4x the price some times up here. Auto parts, cell phones, and internet, we get screwed. Last edited by cedarboarder; 10-11-2018 at 01:26 AM. They've been adopted. That was quick. That’s a lot of slobber and poop. And a $300/wk food bill. How the hell does something like this end up in your tire? Did the wife change the tire? No, then she would know id have to spend money to fix it. Last edited by A&E Exteriors; 10-11-2018 at 02:24 PM. 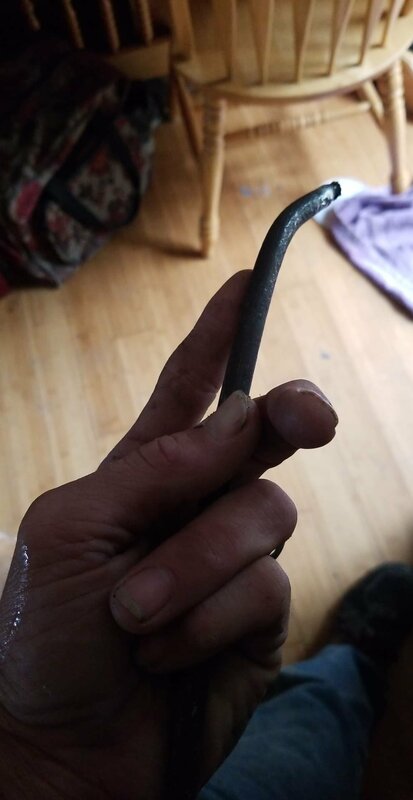 Looks like a screwdriver, minus the handle.